Here it is folks. 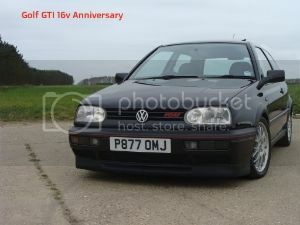 Let's compile a list of all the MK3 Golf Anniversaries left, those on this site and any you might see knocking around on the net, or even one you may see when out and about. If possible, try to confirm spec too such as air-con and/or sunroof, 8v/16v, colour, door number, mileage etc. I will update as more are posted. Anniversaries are listed in registration number order in 8v/16v each post accordingly. You thingy, I was sorting it out as you posted that. Posted is fine mate I will add it shortly. Both added now mate. looks like we got around a quarter of all Anniversaries listed now.